Violins and fiddles are small instruments with four strings that are played with a bow. The terms violin and fiddle are used interchangeably, and they usually refer to identical instruments. However, the terms tend to be used more commonly by certain types of musicians and in certain situations. Fiddle is often used as a term for an instrument used to play folk music, particularly in the United States. It is commonly associated with untrained musicians playing in an informal environment, and it has also traditionally been associated with cheaper and often slightly non-standard instruments. Violin is more often associated with instruments that are used to play classical music, often in a more professional or formal environment. However, highly trained professional violinists may still refer to their instruments as fiddles. There is no clear division between the two words and they are both used to refer to the same instrument. The difference in names stems from the incorporation of terms from two different languages into English. Violin is a Romance or Latin word, while fiddle is a word of Germanic origin, although it is thought that is may have derived originally from the same Latin root as Violin. Within the English language, it is common for words of Latin or Romance language origins to be considered more sophisticated than words of Germanic origins, which tend to be considered plainer. This difference in the perception of Romance and Germanic words appears to be sustained by the terms violin and fiddle. Violin tends to be associated with classical music, while fiddle tends to be a more casual term associated with folk music. Fiddle tends to be used as a colloquial term, even by classical musicians, with violin being considered the more "correct" or polite term for the instrument. In some languages, there is no distinction between violins and fiddles, with the same word referring to all instruments of this kind. In English, the term fiddle usually applies to the violin, but it may also be used to refer to any member of the violin family, such as the viola or the cello, often in an affectionate way. The bridge is the one part of the instrument that may differ between instruments that are being referred to as violins or fiddles, although in many cases the bridges remain identical. Some musicians who play what may be referred to as fiddle music rather than more classical violin music, may alter the bridge of their instrument in order to make it easier to play their chosen style of music. The bridge is a small piece of wood that supports the strings. It usually has a curved top, but folk musicians may alter it, usually by less than half a millimeter, in order to make it flatter. This can make it easier to play certain elements of folk music, such as double stops, when two strings are played at the same time and it can also make it easier to cross quickly between strings, by reducing the amount of movement that is needed to do so. Alteration of the bridge is most often seen in the United States. A violin with a bridge that has been altered in this way will commonly be referred to as a fiddle. However, many instruments that are referred to as fiddles do not have altered bridges. The term fiddle is often linked with folk music, while violin is a term that is commonly used in classical or orchestral situations. However, it is not unheard of for classical violinists to refer to their instruments as fiddles, or for musicians in less formal environments to talk about their violin. The difference between these two terms is often more a product of the environment in which the instrument is being played and the background of the musician, rather than a difference in the actual instrument or the music that is being played. Having said this, the fiddle or violin may also be held differently when used in different playing styles. The violin in conventionally held horizontally, lying along one arm with the end tucked under the chin. This is how the violin is conventionally played, particularly in classical styles. However, in folk music, the instrument may be held much lower down, with the end of the violin placed against the player's chest. Violin and fiddle are two names of different origins that are used to refer to the same stringed instrument. The terms are often associated with different contexts, although they can be used interchangeably. Violin and fiddle are two terms for the same instrument. 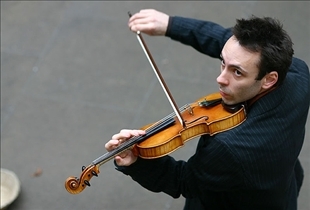 Fiddlers may sometimes alter the bridge of their violin to make it easier to play. Fiddles are sometimes held differently than classical violins. 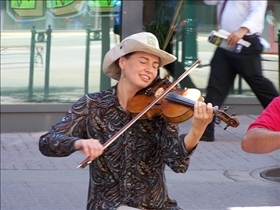 The name fiddle tends be associated with folk music.